At Uleman Irrigation, we only use irrigation systems that optimize water conservation. Our systems feature rain sensors, water stations, and precision nozzles – delivering the same results, with 30% less water. Our brands include Hunter, Rainbird and Toro. Visit our product web sites to access User’s Manuals for your specific sprinkler system. When unexpected freezing temperatures are in the forecast, you may need to drain your system mid-season to prevent damage. You can also complete these initial steps prior to your System Winterization appointment if the temperatures are dropping within the freezing range. 1. Turn off the main shut-off valve (A) which provides water to the system. 2. 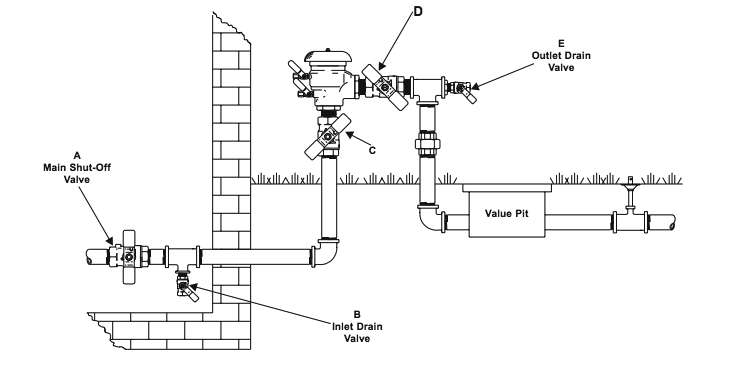 Open all inlet and outlet drain valves on the system (B and E). 3. Open inlet and outlet shut-off valves on backflow prevention assembly (C and D). Leave in half open / half closed (45 degree) position to allow for full drainage of ball valve shut-offs. If drained your system due to a mid-season freeze, you may reverse the steps to continue using your irrigation system for the rest of the watering season.